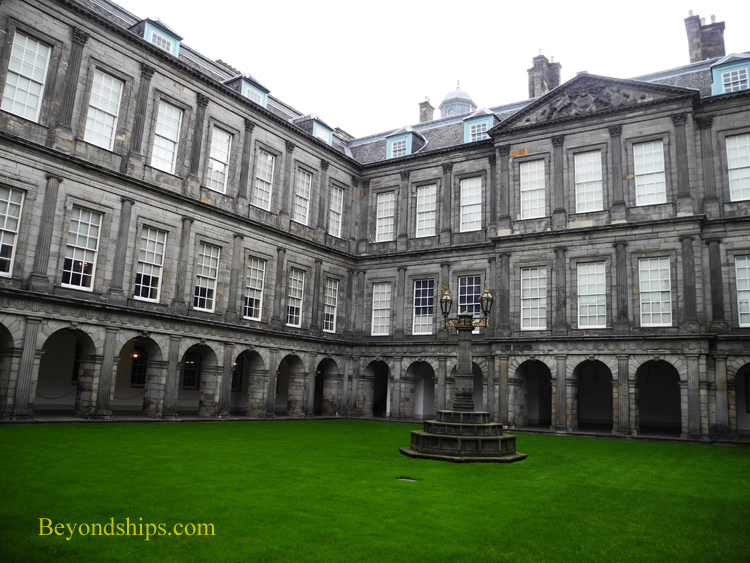 Scottish monarchs have lived at Holyroodhouse for centuries. Moreover, it continues to be a royal residence. Thus, while the Queen does not live there all year long, Holyrood, like Windsor Castle in England, has the atmosphere of a living, functioning house, not the sterility of a museum. While there is a great amount of history associated with Holyroodhouse, it is not just about the past. The Palace of Holyroodhouse, as it is properly called, lies at one end of the Royal Mile in Scotland's capital Edinburgh. It is not the most architecturally impressive palace in the world but it certainly compares favorably to the new Scotish parliament building that stands nearby. In addition, the grounds of the castle are wonderfullly cared for, especially the gardens, and so contribute greatly to the pleasure of a visit. Right: The fountain in front of the palace is a Victorian of a 16th century one at Linlithgow Palace. 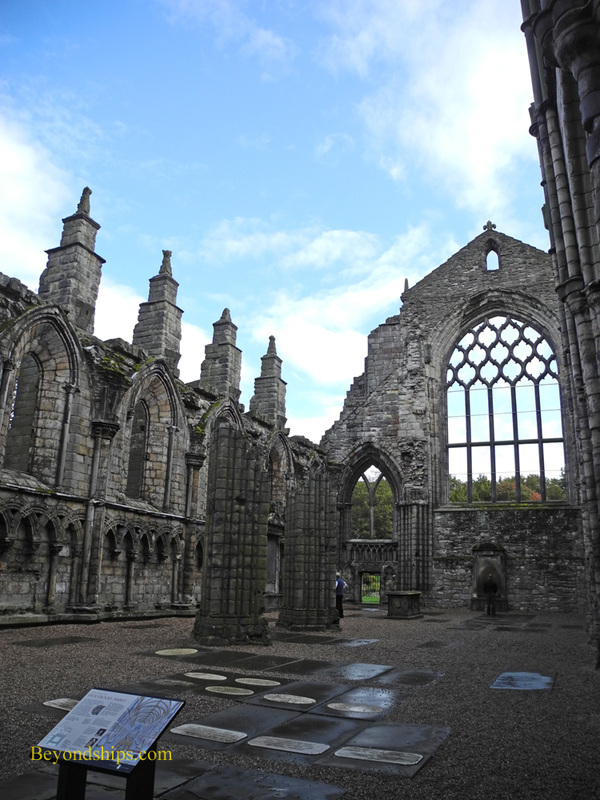 Above and below: The ruins of the church at Holyrood are all that remain of the abbey. A new roof was put on the church in the 1750s but that collapsed in 1768. It was then decided that it would be too expensive to repair it again and the church was allowed to go to ruin. 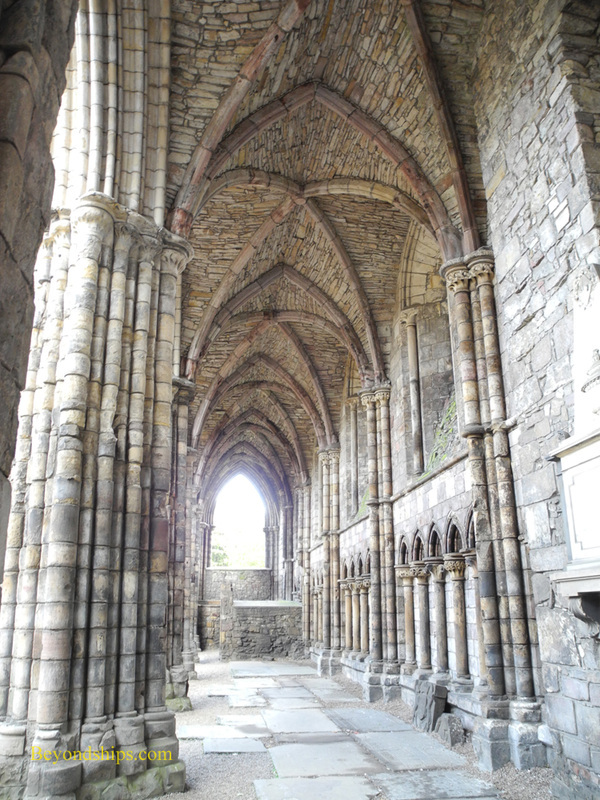 Several of Scotland's monarchs are buried in the church including King James II who was also born, crowned and married in the Holyrood church. Above: Visitors to Holyrood pass a series of out buildings before arriving at the palace. 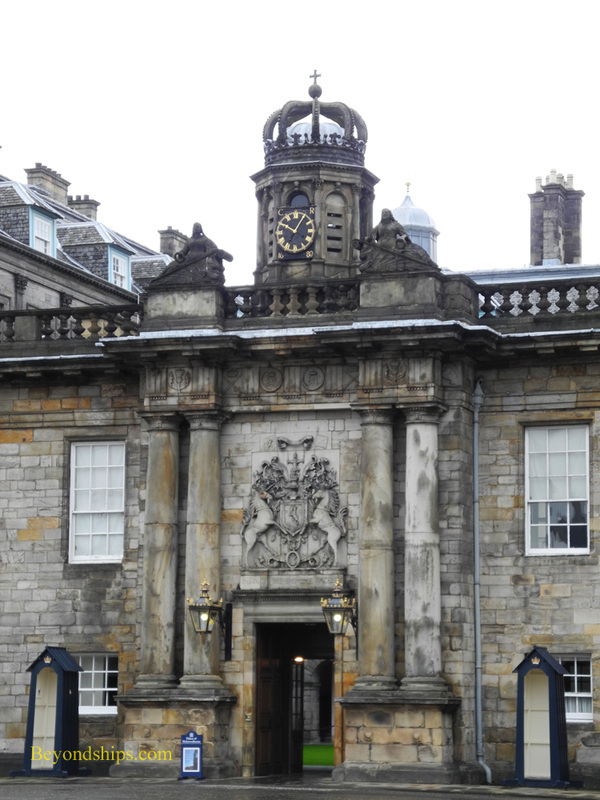 Above: The entrance to the palace through the front created by architect Sir William Bruce and Master Mason Robert Mylne during the reign of King Charles II, The coat of arms of Scotland is over the doorway, flanked by columns. Below: Bruce and Mylne also created the interior courtyard. According to legend, the inspiration for Holyroodhouse came when King David I of Scotland was hunting. He fell off his horse and was confronted by a majestic stag. Between the antlers of the stag, he saw a cross. The stag then disappeared. Interpreting this vision as a miracle, the King ordered that an abbey be built on the site. His mother had brought a piece of the True Cross back from the Holy Land and the king presented this to the new abbey. 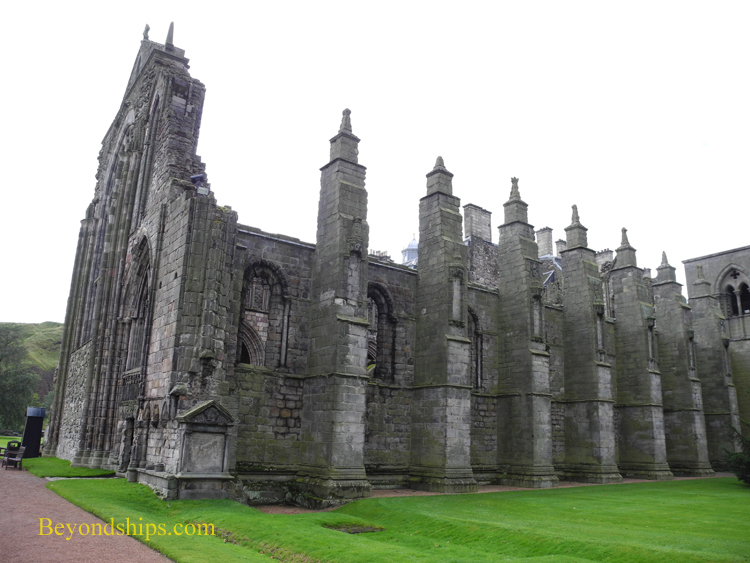 As a result, the abbey was called Holyrood, which means Holy Cross. When the abbey was founded, a guest house was built on the abbey grounds for use by the king. Over the centuries, Scotland's monarchs came to spend quite a lot of time at the abbey, which, because it was surrounded by parkland, was more attractive than Edinburgh Castle. By the reign of King James IV in the early 16th century, the royal lodgings had eclipsed the abbey. Therefore, James decided to turn the lodgings into a palace. Mary Queen of Scots, perhaps the monarch most closely associated with Holyroodhouse, came to live there in 1561. She had been married at an early age to the heir to the French throne and had spent most of her life in the grand palaces of France. Now a widow, she reportedly was not impressed by the relatively austere and smaller palace where she was taking up residence. It was, however, to be the scene of some of the most dramatic episodes in Mary's life. Scotland had changed greatly while Mary was in France. The “Old Religion” had largely been replaced by Protestantism. Consequently, Mary, who remained a Catholic, was distrusted by many of her Protestant nobles and subjects. In an effort towards reaching harmony, Mary had several unsuccessful audiences with religious reformer John Knox at Holyroodhouse. Mary also married the Protestant Lord Darnley at Holyrood. Darnley soon proved himself a drunkard and a wastrel, alienating Mary. Meanwhile, Mary's Italian private secretary David Rizzo, had become close to the queen. Disliking this Catholic influence, a group of Protestant lords persuaded Darnley to join in a conspiracy to murder Rizzo. This they did in gruesome fashion in Mary's presence at Holyroodhouse. Not long after Rizzo's death, Darnley was murdered. He is buried in the Holyrood church, at least most of him is - - a mob broke into his tomb in 1688 and stole his head. Mary then married Lord Bothwell, who had befriended her and who is also believed to have instigated Darnley's murder. The marriage was performed according to Protestant rites in the Great Gallery at Holyroodhouse. This marriage also angered a number of factions leading to civil war, Mary's abdication, her escape to England and eventual beheading after being implicated in plots to assassinate Queen Elizabeth I.
Mary's son, King James VI spent a considerable amount of time at Holyroodhouse. However, this all but ended when he became King James I of England as well as king of Scotland. James' son, Charles I of England, was crowned at Holyrood but the ceremony was so anglicized that it angered his Scottish subjects, one of the many events that eventually led to Charles' beheading. After the restoration of the monarchy in 1660, Charles II, Mary's great grandson, undertook an extensive renovation of the palace. The architect William Bruce is largely responsible for the Baroque palace that we see today. He blended the older existing portions of the building with new construction creating a harmonious whole. His patron, however, never lived there. 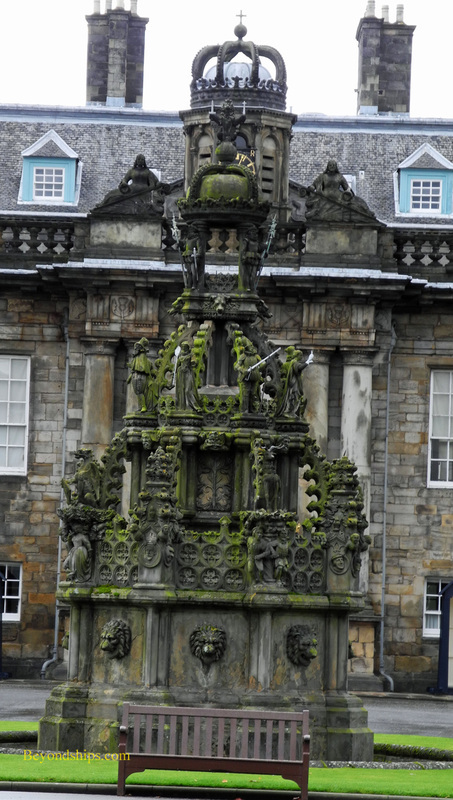 Holyroodhouse received little royal attention for the next century and a half. In fact, its more illustrious residents during this time were members of deposed royal families. Bonnie Prince Charlie made a public display of living at Holyroodhouse during his attempt to gain the British throne for his father. His thinking was that he should be seen acting as a royal so that people would regard him as the true heir to the throne. After the Comte d’Artois unsuccessful attempt to reverse the French Revolution, the British government allowed him to take up residence at Holyrood. This was very convenient for the Comte who did not have any money to pay his soldiers. 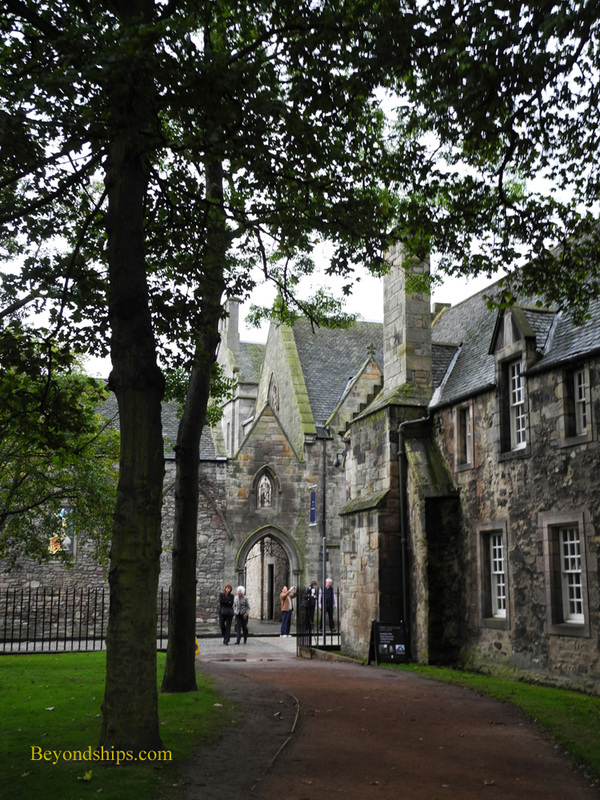 Dating back to the days when the palace was an abbey and provided sanctuary, the law was that debt collectors could not seek to collect debts from people living on the grounds of Holyrood. The Comte eventually left to become King Charles X of France. He returned when he was deposed in 1830. The writings of Sir Walter Scott drew the attention of the public and the monarchy back to Scotland at the beginning of the 19th century. George IV became the first reigning monarch since Charles I to visit Holyrood during a very successful visit to Scotland in 1822. He ordered that no further changes should be made to Mary Queen of Scots' apartments. George's niece, Queen Victoria, was even more taken with Scotland and visited it frequently. She carried out an extensive renovation program on Holyrood and cemented its place as a modern royal residence. After World War I, King George V carried out another round of improvements to modernize the palace. 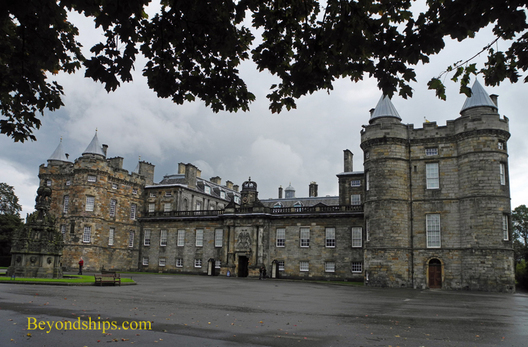 It was during his reign, in 1920, that Holyroodhouse became the official royal residence in Scotland.